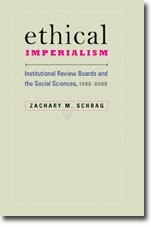 Institutional Review Blog: Zywicki, "Institutional Review Boards as Academic Bureaucracies"
Zywicki, "Institutional Review Boards as Academic Bureaucracies"
As stated in the abstract, the article "argues that the problem is that IRBs are fundamentally bureaucracies, and that this bureaucratic structure explains much of their frequent suboptimal decision-making. The poor performance of IRBs is thus not a consequence of those individuals who comprise it, but rather a reflection of their bureaucratic nature. The bureaucratic nature of IRBs appears to do nothing to improve the decisions that they make, while being the source of many of their problems." Zywicki is right to note that people who gain money, power, and prestige from controlling other people's work have an incentive to define their duties broadly, even as they fret about researchers' conflicts of interest. Ironically, he seems only dimly aware of the extent to which administrators have seized power from researchers. He writes, "IRBs are fundamentally bureaucracies," not understanding that IRBs themselves are committees of researchers, and that the true bureaucracies are the university compliance offices. He notes, "there is reported to be a growing IRB conference circuit," suggesting his unfamiliarity with PRIM&R and its administrator-dominated conferences. And he makes no mention of the creation, in 1999, of the "Certified IRB Professional" as a new kind of administrator, someone who has staked a great deal on the maintenance, if not expansion, of IRBs' reach. How much of the growth of IRB staffs is due to the internal dynamic Zywicki stresses compared to the growing external threat of federal penalty? One way to find out would be to compare the growth of compliance regimes to major OHRP enforcement actions. If as Zywicki notes, the Northwestern University Office for the Protection of Research subjects "grew from two full-time professionals in the late 1990s to 25 professionals and an administrative staff of 20 last year," I'd like to know how much of that growth took place as a response to the suspension of sponsored research at Hopkins, Virginia Commonwealth, and other universities. Without far more research on the actual workings of IRBs and compliance offices around the country, we can't test hypotheses such as Zywicki's.